16/190 Max Braden The trailer made me think Jim Carrey's hamming it up would be annoying, but this was really pretty funny. How far would you go for love? Steven Russell answered this query by frequently escaping the sturdy metal bars of a Texas prison. On four separate instances Russell found himself barricaded from his love, and four different times he used is impressive wit, skill, imagination, and determination to create a private exit. I Love You, Phillip Morris sets out to relate the amazing, tragic, and true odyssey of a unique man. Russell was not always a perennial jailbird. He lived the seemingly honest life as an accountant, father, husband, and church organist. But despite living the American Dream, Russell was lying to himself and those around him. A series of events led him to come out of the closet and start anew. Hard times soon followed and led him down the life as a con man and into a prison cell where he met his Muse, Phillip Morris. Phillip and Steven hit it off and quickly became lovers. It did not make sense for Russell to stay behind when his soul mate was released, marking the beginning of the prison breaks. Jim Carrey brings the ambitious, if criminal, Russell to the screen. Not one to pass up a chance to do something different, Carrey has a long history of branching out into roles that allow him to sport more dramatic chops. His most recent attempt, The Number 23, crashed and burned with critics and audiences alike. He has, however, been more successful in the past, earning acclaim most recently in Eternal Sunshine of the Spotless Mind. Most famously, Carrey was snubbed of an Oscar nod back in 1999 for The Truman Show, despite winning the Golden Globe in the drama category. This ignominious slight paved the way for the unfortunate current state of affairs, which is to say Jamie Foxx is the first In Living Color alum to earn Oscar glory. Since we are on the topic, how did Carrey’s impression of Andy Kaufman become relegated as shtick, whereas Foxx’s impression was trumpeted as art? Alas, despite a handful of dramatic wins, Carrey has been much more commercially triumphant with straight comedies, including Bruce Almighty and How the Grinch Stole Christmas. Ewan McGregor comes along for the ride as the dreamy Phillip Morris. McGregor seems to jump from the indie world to Hollywood fairly routinely, and past steamy scenes should make him more comfortable with the material. Mrs. Judd Apatow, Leslie Mann, adds her comedic grace early on as Russell’s wife. Rodrigo Santoro, most comfortable portraying dictators (Xerxes of 300 and Castro in Che) bursts on the screen as the first gay lover for Russell. 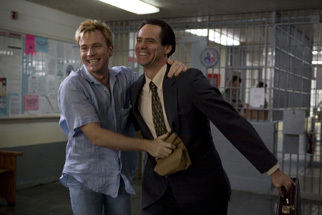 See the latest developments for this project on the I Love You Phillip Morris Movie News page.